So, given the slight sense of disappointment around the iPod mini (OK, they'll no doubt tug at my heartstrings when I see how small they are in the flesh, but the price just seems too high. Check elsewhere - here, here, here, & here - for better debate) it feels like extensions of the iPod are where the interesting work is located right now. Check the growing list of accessories which Apple are collating. Or the ever-widening range of discussions about the way people use their iPods in 'everyday life'. Or want to use them. "I like to listen to “Morning Edition”on the radio in the mornings. Why shouldn’t the broadcast follow me from bathroom to bedroom to kitchen, then into the car?" There is a rich future for those who figure out the protocols, handshaking, data transfer etc. around connecting these devices up, such that the user experience of listening effortlessly drifts across devices and spaces just as you do. It's akin to the variations on the tunA idea a few of us spun around a while ago - although the integration with home hifi is new, and and feels something like the "last few centimetres" problem a lot of us currently face, when trying to hook up mp3s to hifis. Why can't wireless connectivity extend to, er, the wireless? My problem is that my music has expanded way beyond my laptop, such that I use an 120gb external drive as my main iTunes library. This makes it difficult to sync up with my laptop. I would guess Tom's right when he says most people have their music collection on one hard drive (on their iMac or iBook or whatever), but I can't imagine this will last. And I think this is possibly one of the reasons Apple introduced a dock to the iPod, as well as some ease of use and USB2/Firewire manufacturing shortcuts, no doubt. There are so many issues with connecting these devices. In fact, in the above scenario, if I then connect my dock to my laptop the music cuts out with a ugly abruptness, as iTunes starts up, taking control of the iPod. So, should it continue playing? Probably. But what should be the 'active' music library at that point? The iPod's? Or the laptop's? There are other issues - should the laptop become aware of the listening I've been doing with the iPod (updating any on-the-hoof rating I've done? The playcounts?). Again, probably, but as far as I can tell now, the main iTunes music library does not sync the ratings I've done of those same tracks on the iPod. I'm not sure there's a good reason to keep these separate - it could be argued that I might want to have a different rating listening to that same music on my iPod (environmental conditions etc. ), but it's a flimsy argument. Know what I'd like? 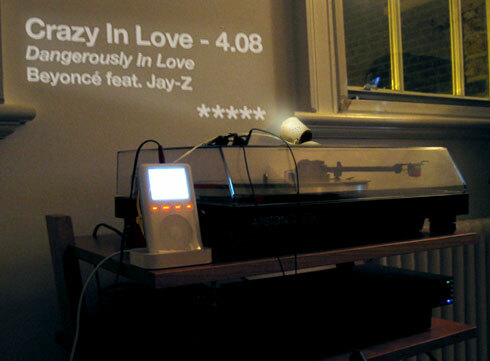 A mini projector connected to iPod (or PowerBook) which simply projected what was on iPod screen - or on Synergy on PowerBook - displaying what was playing. Given the dock scenario above, the iPod tends to be situated close to the hifi (an audio jack lead away) and would it be fair to assume that people don't sit next to their hifi? i.e. that they sit further away. If that is the case, it's annoying that an iPod screen can't be read from >50cm away - so given the desirability of shuffle mode, you have to keep getting up to check what's playing. I know an iPod remote control could do this, but that seems a little cumbersome i.e. that's a device to pick up and fiddle with, rather than the nicely backgroundable, almost ambient, light of a small projection. Here's my mockup of what I need! Or does such a thing exist?